i don’t know his name. i often saw him in this old and repaired furniture store but i never spoke with him. he always looks a little bit sad. or tired. or maybe both. 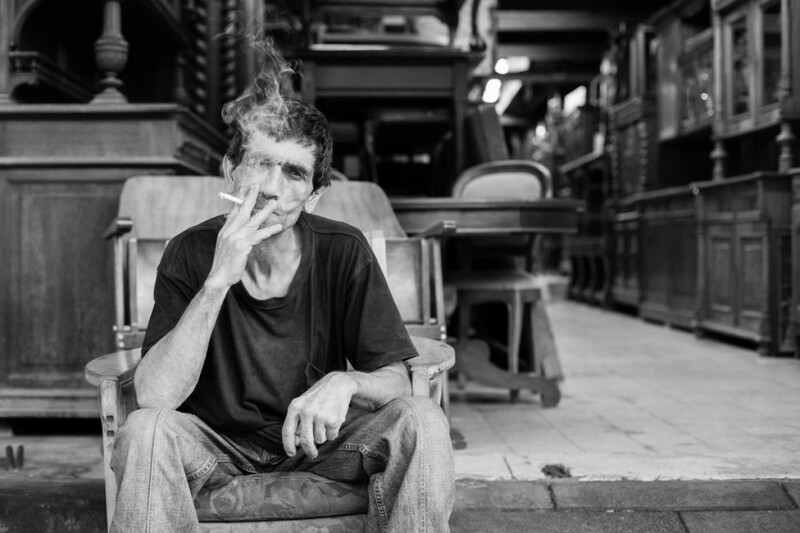 once i asked him for the portrait – you know this indication with a finger on the camera that said “can i take your picture?” and he answered me without any word but with the same imperceptible gesture “be my guest !”, continuing to smoke his endless cigarette. here is no need to say me twice – i always ready for the quick changes of the mood and plans, so i did it through the “veil” of smoke. one day i’ll bring him this picture and maybe i’ll see his smile. well, may be not. great first posting and typical story. i vision this situation with you and him in my mind 🙂 hope to see more of your street portrais here now and then and read your stories. thank you for this contribution, honey. thank you for taking a look and very kind words. indeed Lena ! thank you ! Victor- this is a great photo of the unnamed smoking man ! It figures he would not speak! He still gives my imagination a story . I do love to see you contribute to this great sight . I am not yet brave enough to approach a stranger. I would probably studder or drop my camera! HA! Trillian this site is so AWESOME ! You and Ijon have done great work. I want to have some time to sit and read for awhile like a good book. Good Luck !